Oral and Maxillofacial Radiology AKA (Dental and Maxillofacial Radiology) is that specialty of Dentistry concerned with performance and interpretation of diagnostic imaging used for examining the craniofacial, dental and adjacent structures. OMFR or DMFR is one of nine dental specialties recognized by the American Dental Association, Royal College of Dentists of Canada, and Royal Australasian College of Dental Surgeons. Oral and maxillofacial imaging includes, but is not limited to, cone beam CT, multislice CT, MRI, PET, ultrasound scan, dental panoramic radiology, cephalometric imaging, intra-oral imaging (e.g. 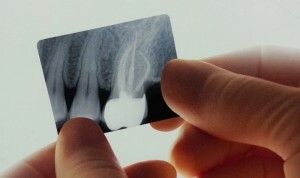 Bitewing, peri-apical and occlusal radiographs) in addition to special tests like sialographs. Visible light, optical coherence tomography and tera ray imaging are examples of additional methods in use or under development. Image guidance includes Haptic and Robotic devices.